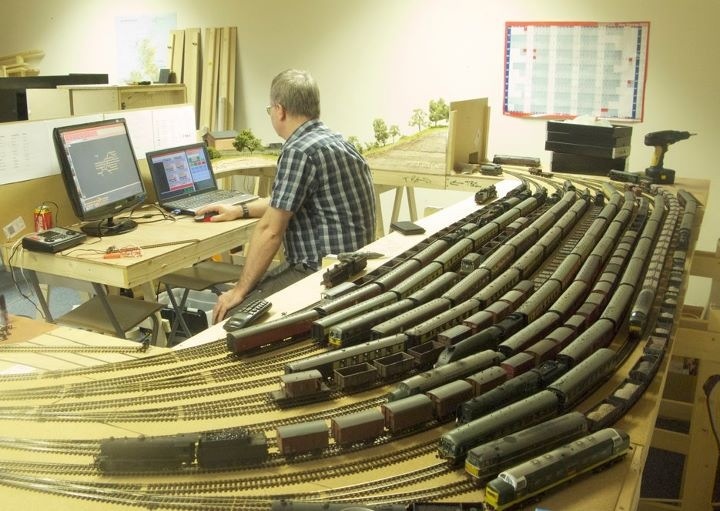 Regular readers will by now know that I can often be found behind one of the many layouts built and exhibited by Mike Wild, Editor of Hornby Magazine as part of their stand at shows. This weekend sees Bolsover and Seven Pit lane making an appearance, along with 22 other layouts, at the Leamington and Warwick Model Railway Society’s 37th annual exhibition, being held at the Stoneleigh Park Exhibition Centre nr. Warwick. I will therefore be playing with mainly Eastern Region stock rather than my usual Southern bias (not to mention the black art that is DCC!) but I am sure I will cope. Mike has been very busy working on Bolsover since its last outing at the Spalding show last November as the traverser has been been totally replaced with a more traditional fiddle yard. This along with a few adjustments made to enable the goods yard to be fully operational will enable a more varied scope sequence of operation to be achieve. One of the intersting aspects of operating this layout is that it is one of the very few, to date, on the exhibition circuit operated by Hornby’s Railmaster system and the only one utilising the beta version of Railmaster on hand held Palm devices. Also much of Mike’s fleet of Eastern Region stock being used is now sound fitted giving an additional dimension. If you are planning on attending this exhibition please come and say hello. I’ll be there too with my 3mm scale layout Flockburgh. Please say hello to me as well ! Well I will make sure I say hello to you as well as long as you say hello to me!